TAMPA, Fla. - Nov. 1, 2018 - PRLog -- Barbara Brown from Brown & Associates Law & Title, P.A. is pleased to announce the addition of associate attorney Kevin E. Paul to our Tampa, Florida office. Kevin has represented thousands of defendants in residential mortgage foreclosures at all stages of litigation including trials and contested hearings. Additionally, he has successfully negotiated various types of settlements without the need for trials including agreements involving cash for keys, loan modifications, and short payoffs. Kevin graduated from the University of Michigan with a Bachelor of Arts, in Political Science in May of 1996. He obtained his law degree in Los Angeles, California at the Southwestern University School of Law in May of 2004. With previous experience in real estate legal defense, trials by jury, working with legal issues relating to loan documents and title, we are very excited to add him on our team. 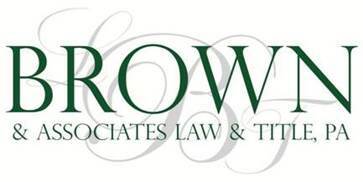 Brown & Associates Law & Title, P.A. focuses on commercial and residential real estate law and residential and commercial title closing. We help people all over Tampa Bay who are in foreclosure or heading towards foreclosure. We also have assisted many with bankruptcy relief, loan modifications, short sales, or deeds-in-lieu of foreclosure. Brown & Associates Law and Title serves the entire Tampa, Clearwater, St. Petersburg, and the surrounding Tampa Bay area.